My plans for the day went out the window when my friend called and asked if I wanted to get together for coffee in the early afternoon. I decided I could wait another day to do my laundry, and I didn't really need to go to the grocery store, either. So I trotted up the street to the coffeeshop. Since it's Knit Night at the shop I brought my knitting with me. It was good to see my friend--we've been talking regularly on the phone but I hadn't seen him in a couple of months so it was good to have the chance to really catch up on everything that's going on in our lives. And as a bonus, I was able to knit while we talked, so in the two-plus hours that we spent together, I crossed the hump on the sleeve I was working on. You know what hump I'm talking about. You finish the front and the back and you're all excited because all you have left is the sleeves. Yay! Then you cast on that first sleeve and get going. 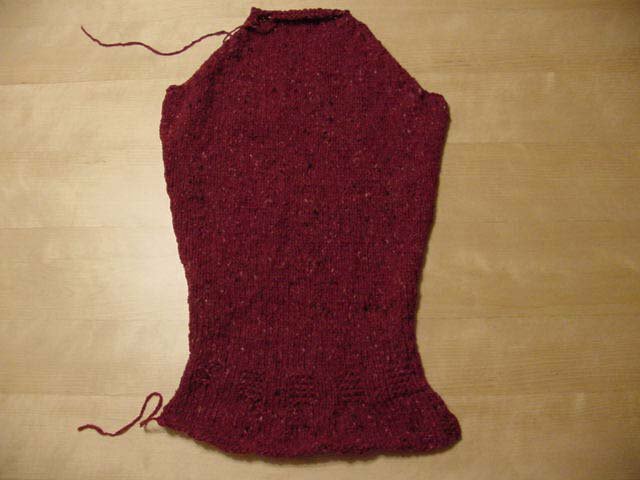 You rip through the rib in no time flat, then you change needles and start the increases. And then you remember just how many increases you have to do before you get to the sleeve cap. And the rows between the increases just take longer and longer and it seems like you'll never get to that cap. And then all of a sudden you're there, and you can start your decreasing and the rows get smaller and smaller and move faster and faster until you're casting off and you're done. And the second sleeve won't seem so bad, because you're no longer under that "just-finished-the-front-and-now-all-I-have-to-do-is-the-sleeves" spell. So what you're looking at up there is the first sleeve of Anya. It desperately needs blocking, but it's done done done! And the second sleeve won't take nearly as long. And then I can put it together. And then I can start something new.